The mass, size, and gravitational parameters are those adopted by the International Astronomical Union (IAU) in 1976 [Muller and Jappel, 1977]. 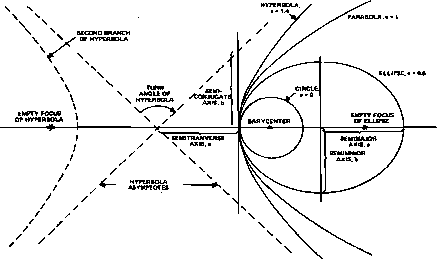 The geocentric and geographical coordinate system conversions are based on the method adopted by the American Ephermeris and Nautical Almanac [H.M. Nautical Almanac Office, 1961] using the updated value for the Earth's flattening adopted by the IAU [Muller and Jappel, 1977]. The properties of artificial satellites, both in orbit about solar system objects and in transfer orbits between objects, are calculated from the parameters given and are based on Keplerian orbits with no perturbative corrections. The properties of the Earth's upper atmosphere are from the 1972 COSPAR International Reference Atmosphere , and the US. Standard Atmosphere . Additional constants are from Allen , which is an excellent source of additional astronomical information. See Chapter 3 for definitions of orbital quantities and planetary magnitudes. Table L-l lists the orbital properties of the major planets. Because of orbital perturbations, the data here are not tabulated with the full precision normally used for ephemerides. If greater accuracy is needed, consult the American Ephemeris and Nautical Almanac for current osculating elements or Section 5.4 for epemerides for computer use. Quoted data are from Allen . Table L-2 lists the physical properties of the Moon and planets. Additional data on the Earth and Moon are given in Sections L.3 and L.4. Properties of the natural satellites of the planets are given in Table L-3.